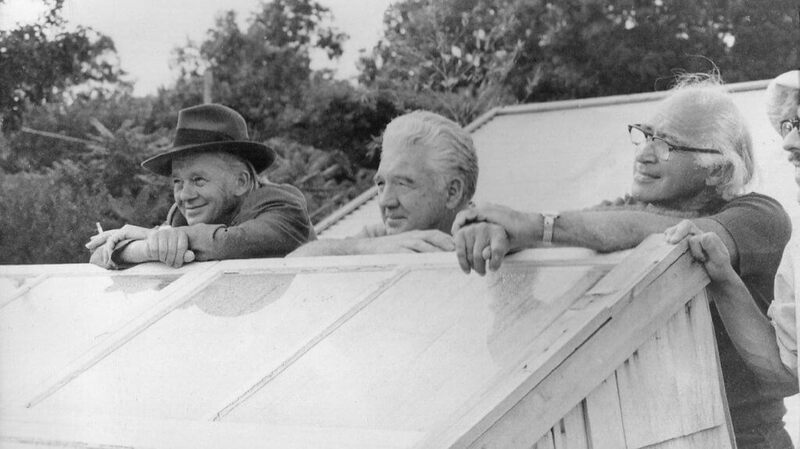 LEFT TO RIGHT: E. F. Schumacher, Robert Swann, and George Wald at New Alchemy Institute in 1974. Since its founding in 1980 the Schumacher Center for a New Economics has been preserving and building upon the lifework of E. F. Schumacher, the German-born British economist. Because of his opposition to Hitler, Schumacher left Germany before the Second World War and spent the rest of his life in England, where he was a pioneer in integrated thinking about economic, environmental, and cultural issues. His advocacy of a new value-imbued economics offers a clear and compelling vision for action. He is best known for his critique of Western economies and his proposal for human-scale, decentralized, and appropriate technologies. Robert Swann was the founder of the E. F. Schumacher Society, now the Schumacher Center for a New Economics. In 1974 Swann, Hazel Henderson (author, futurist), and Ian Baldwin (who later founded Chelsea Green Publishing) arranged for E. F. Schumacher’s first lecture tour in the USA. While on the tour, E. F. Schumacher asked Robert Swann to start a sister organization to his own Intermediate Technology Development Group, but it was not until 1980, when prompted by Resurgence editor Satish Kumar, that Swann, together with Susan Witt, organized the E. F. Schumacher Society in Great Barrington, Massachusetts. Its work now constitutes a direct link with Schumacher’s philosophy and is a tangible embodiment of his message. George David Wald was a biologist who was a joint winner of a Nobel Prize in 1967 for his research on how the eye passes images to the brain. In 1969 at the Massachusetts Institute of Technology, he gave a widely cited speech criticizing the Vietnam War and the arms race. Dr. Wald’s speech was printed in many newspapers and was featured in an issue of The New Yorker. He became an energetic advocate of what he called ”survival politics,” visiting college campuses and speaking on subjects including the cold war, human rights, and liberation movements. -from “The Origins of Life” by George Wald in The Scientific Endeavor: Centennial Celebration of the National Academy of Sciences, 1965. Dr. Wald was visiting on one of the days during E. F. Schumacher’s tour in the USA in 1974. As it happened, the day we visited New Alchemy, an open visitor’s day, there was a Life magazine photographer and reporter who had just returned from Germany with a story about a woman—a nun, I believe—who had been on a total fast (no food or water) for a number of days. I don’t remember exactly how long, but longer than it was “scientifically” possible for a human being to live. As it happened, George Wald, a recent Nobel Prize winner in biology, was also visiting. When he heard the Life reporter telling this story he couldn’t resist challenging the reporter and began giving all the scientific evidence as to why it was impossible, but the Life reporter continued to persist and maintained that he had checked all the evidence and he could see no reason why the woman was lying. He and George Wald continued to carry on a lively discussion with neither one backing down from their position. At that point, to my surprise, Fritz jumped into the argument on the side of the Life reporter. His argument was simply that we do not know enough to be able to say “without doubt” that such a thing could not happen. But George continued to insist that if it could not be proven “scientifically,” then it could not be true. It struck me at the time that there were two men representing the two opposing philosophies of our time and age. In 2001 Stephanie Mills began writing a book about Bob Swann. The edited passages below are from Bob Swann’s “Positively Dazzling Realism”, a lecture that Mills gave based on her then draft of her book On Gandhi’s Path: Bob Swann’s Work for Peace and Community Economics (2010). Bob Swann left college to work on a farm in Ohio, then went to live in an intentional community in Vermont. He was there when the federal marshals came to arrest him in 1942 for violating the Selective Service Act. Bob Swann was one of 43,000 Americans who refused to fight during World War II; he refused alternative service and was jailed along with about 6,000 other war resisters. They said, you have no claim on my time, no claim on my person. I’m not going to cooperate with this, even to the extent of going and planting trees or doing alternative service. As Susan Witt, Bob’s partner in his later life, put it, “Prison was Bob’s monastery and his university.” This does not gainsay the hardships the C.O.s endured. Jailing these youthful pacifists tested and strengthened their commitment. In prison Bob and his fellow C.O.s protested Jim Crow policies and regimentation generally. “I tried to be a nice troublemaker,” he said. In the late 1960s Ralph Borsodi, another radical decentralist and economic innovator, and Bob Swann founded the International Independence Institute. Among its many initiatives the Institute had by the early 1970s produced a handbook,The Community Land Trust: A Guide to a New Model for Land Tenure in America, that would help launch a scattering of “back to the land” trusts around the United States and spur the idea of urban land trusts, hundreds of which have been established throughout the country. Bob kept doing design and construction. By this time E. F. Schumacher’s essays—which had been known to Bob first through the weekly Peace News from London and then in the pages of Resurgence magazine—and several of his lectures had been collected and published as Small Is Beautiful: Economics As If People Mattered. The book was languishing, and Bob became its champion. With Hazel Henderson, doyenne econoclast, Bob helped organize a U.S. lecture tour for Schumacher in 1974. Around 1979 the International Independence Institute had spawned the Institute for Community Economics. ICE was carrying forward the work on community land trusts and other economic innovations. Susan Witt, a Waldorf educator, had been drawn to this work by a sense that in our time the challenges calling for actual heroes were in this realm. Ere long Bob and Susan embarked on their long, productive partnership. In 1980 they were asked to come to the Berkshires to establish a regional land trust. They fell in love with the area and decided to stay. In the same year, Resurgence editor Satish Kumar, John Papworth’s successor, encouraged Swann and Witt to establish an E. F. Schumacher Society [now the Schumacher Center for a New Economics] in America.